About half a year ago, my son ran into the kitchen to notify me that there were "some weird bugs" in his room. He's nine, and if he didn't know the name of the bugs he saw, I knew it must be something pretty strange. My first responses were: "How many weird bugs?" and "Where exactly are they?" He replied, "Lots of them!! They're behind my bookshelf and sort of white." I didn't know what to expect, and frankly, I was shaking in my boots due to my very real bug phobia. When we went into his room together, my son pointed to his bookcase, which he had moved out from the wall because he'd dropped some coins behind it. It's a good thing he had, as we were about to uncover a serious pest problem. I looked closely and saw a pile of sawdust with tiny little white (almost transparent) bugs. I knew right away they were termites. I was shocked, aggravated, worried, and -- above all -- grossed out! They were literally eating away at a pencil and the back of the cheap two-shelf bookcase. I swept the bugs up and tossed them into the dumpster outside. Since my husband and I checked around the house and didn't see any other termite damage, we just ignored the situation. Yes, I know what you are thinking. How could we have walked away from termites? There are always more! And they are often in places (such as in the foundation of a house) where one can't see. We should have known better. And so, here I am about 6 months later, and we have found more...lots and lots more. This time they are eating away at the closets in our bedroom and laundry. There are mud tunnels on our walls and ceilings, and behind the closets. The termites are just chomping and chomping at the wood as fast as they can. The termites have also made holes in many of our winter clothes which were stored in our closet for the summer. The holes are really small, but there are lots. We had to throw away a bunch of shirts, and I am really upset about that. 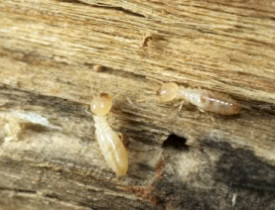 I never even knew that termites eat through clothing. I have learned that they enjoy clothes made of natural fibers, like cotton. Don't worry; we didn't just walk away this time. We finally contacted an exterminator who will be coming in a few weeks to get rid of these termites. He's going to drill holes in our walls and floors and inject a poison. The idea is that the termites will bring the poison to the queen and it will kill her off. Once she is gone, there won't be any more termites. The exterminator told us that we are going to have to leave our house for 2 days, but it's so worth it. Does an Exterminator Need a License?